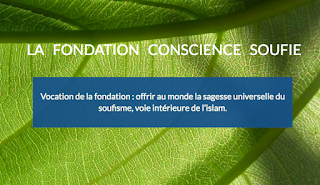 A new Traditionalist Sufi organization has been established in France, the Fondation Conscience Soufie or Sufi Awareness Foundation. The Foundation's objective is to "offer to the world the universal wisdom of Sufism, the interior way of Islam." It has been established by four French Sufi Traditionalists: Éric Geoffroy, Slimane Rezki, Néfissa Roty-Geoffroy, and Idrîs de Vos. The two Geoffroys and Vos come from families associated with the classic Paris Alawiyya of Michel Vâlsan (1907-74), and Rezki is the author of René Guénon : l’homme, le sens de la vérité (2016), recently launched in Cairo. The objectives of the Foundation are education, mediation, research, arts and travel. Education covers both Sufism and the Arabic language, as both Néfissa Roty-Geoffroy and Idrîs de Vos are professional Arabic teachers. Mediation includes training, for example of prison guards in connection with counter-radicalization efforts. Research includes translation, and presumably also Éric Geoffroy's work at the University of Strasbourg, where he teaches. Arts includes cultural evenings with concerts and performances. Travel, finally, includes pilgrimages to Islamic and Sufi sites, and retreats in the desert and other inspiring places. At present, the Foundation is most active in the fields of education and travel. A series of seminars in Paris and Geneva, mostly directed by Éric Geoffroy and Slimane Rezki, have been announced, and the Foundation's website sells books, mostly by Éric Geoffroy. There is also a retreat in the Moroccan desert scheduled for February 2017, led by Éric Geoffroy and facilitated by a Moroccan tour company, with a program including meditation or prayer at dawn, and dhikr in the evenings. The first seminar, on October 14, is in Paris, and is on "Sufism and Sharia: Relations between exoterism and esoterism in Islam," a classic issue, from both Sufi and Traditionalist perspectives. These activities--seminars, publications, and pilgrimages--are not new. What is new is that they have now been publicly brought together under a single umbrella. According to the Foundation's website, this has been endorsed by Bariza Khiari (a female senator for the socialist party, and a prominent advocate of Sufism), by Abdel Wahed Yahia Guénon (the grandson of René Guénon), by Faouzi Skali (discussed in my Against the Modern World), by Seyyed Hossein Nasr of the Maryamiyya, and by a number of French intellectuals, mostly Muslim. Slimane Rezki is launching his new book on Guénon, René Guénon : l’homme, le sens de la vérité (René Guénon: The man, the sense of truth; Paris: Al Bouraq, 2016) at the French Institute in Mounira on Wednesday, October 5, at 18:00, under the auspices of the French Embassy in Egypt. The event is co-sponsored with the Azhar (section of Francophone Islamic Studies) and the Fondation René Guénon (René Guénon Foundation) of Abdel Wahed Yahya Guénon, and is notable because Guénon has recently been relatively neglected in Egypt, the country that he made his home. Rezki himself is also notable, as a French Guénonian of the younger generation, who is active not only in writing but also in giving courses and conferences, especially for the Fondation Conscience Soufie (Sufi Conscience Foundation) of Éric Geoffroy. This organisation is a major hub for Sufi Traditionalism in France. My thanks to Hatsuki Aishima for bringing this event to my attention.